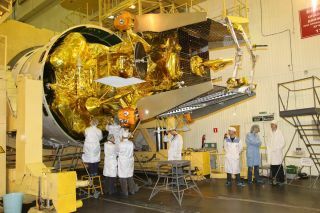 Russian space engineers seal the Mars Phobos-Grunt spacecraft inside its Zenit 3SL rocket nosecone for a Nov. 2011 launch toward the Red Planet to explore Mars and its moon Phobos. The European Space Agency will once again attempt to call the Russian Phobos-Grunt spacecraft tonight (Nov. 29), after officials received no response yesterday from the beleaguered probe, which has been stranded in the wrong orbit since it was launched earlier this month. The Russian Phobos-Grunt mission lifted off Nov. 8 on a mission to collect samples from the Mars moon Phobos, but a malfunction with the spacecraft's thrusters left it stranded in Earth orbit, rather than accelerating on toward the Red Planet. Russian officials have struggled to contact the spacecraft, but the European Space Agency (ESA) announced last week that a ground station in Australia had picked up signals from the troubled probe. Since then, though, repeated efforts to call the spacecraft have failed. Yesterday, ESA officials sent commands to Phobos-Grunt to raise the spacecraft's orbit, but the instructions went unanswered. "ESA informed by #PhobosGrunt controllers that last night's orbit-boosting commands did not execute," agency officials said via Twitter today. At the request of Russian mission controllers, teams at the European radio station in Perth, Australia will try sending the orbit-boosting commands again tonight, they added. Russian officials were unable to decipher the information that was received from the Australian ground station last week, but it was reported that data had come in to a Russian station in Baikonour, Kazakhstan that indicated the spacecraft's radio equipment was operational, according to the Russian news agency Ria Novosti. Despite the international partnerships trying to save Phobos-Grunt, time is quickly running out to rescue the $165 million mission. Phobos-Grunt was launched aboard a Russian Zenit rocket, but once in orbit, the spacecraft's propulsion system failed to fire in the maneuver that would have sent it on its way to Mars. The window of opportunity for the probe to reach the Martian moon may have closed already, since the journey requires Earth and Mars to be properly aligned. The ambitious Russian mission was designed to study Phobos and return rocks from the Martian moon to Earth in 2014. If Phobos-Grunt cannot be saved, early estimates suggest the spacecraft could fall back to Earth sometime in mid-January.